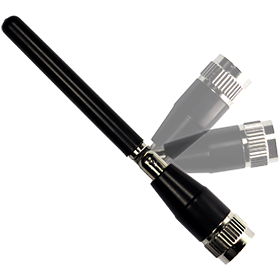 The MON Series monopole LTE antenna provides excellent performance in a tiny package. This makes it ideal for small devices, particularly when used for the Internet of Things (IoT) and with the emerging LTE-M (Cat-M1) and NB-IOT standards. Covering all major bands used by LTE, 4G and 3G cellular technologies, the MON Series has a tilt and swivel joint that allows it to be positioned for optimum performance in the product or folded against the enclosure for shipping or transport.